Research has shown that for workers over the age of 55 a workers’ productivity is often lower than their wages. Considering the current demographic picture, the percent of the civilian labor force over 55 is only going to increase. The current society wide implicit and explicit seniority based pay system is not sustainable. Things will have to break somewhere, and it is more likely to happen in the private sector than in the unionized public sector. An interesting post over at NCBI ROFL highlights an editorial that looks into the question “Why are modern scientists so dull?” The theory is basically that the academic filtering process selects people who have moderately high IQs and are high in Conscientious and Agreeableness. Conscientiousness is also preferred to high IQ, as fine attention to detail in projects and tests is driven more by hard work than by brilliance. Agreeableness helps future professors work their way through the bureaucratic politics of modern academia. This process weeds out Psychoticism, which is correlated to creativity. The really high IQ people are also weeded out, as they will not necessarily have high conscientiousness or agreeableness. This may be true, but if this was always the case then things aren’t getting worse, it is just another instance of someone recognizing a problem in their own time and thinking that it has gotten worse due to a romanticism of the past. So in order to find out the truth of things, we must analyze what has changed. Scientists who can get grants are rewarded over brilliant scientists. Due to the incentives of grant givers, there will be more type leads to more type II errors in which brilliant scientists are denied grants because the grant committee is afraid of being taken in by a charlatan. Specific grants lead to less open ended research, though this effect would have to be measured. Researchers generally don’t get tenure and control of their own research agenda until their fluid intelligence is on the wane. Decreased willingness to criticize high status professors who review the grants in specific fields. The monitoring of subsets of mostly self-contained fields is checked by others in the same small circle. It is harder for outsiders with revolutionary theories to get published in specialized journals. The increased number of scientists in general makes brilliant patent clerks harder to pick out of the hay stack. Most academic journals are still walled off from the general population, but this is much more of a continuing problem than it is a new issue. The reaction of Berkeley’s campus to the research of Arthur Jensen as described by Victor Niederhoffer is one example. The sociology and psychology professors who were protesting his work could not have read his research because the only two copies of the journal were checked out by genetics professors; they opposed it based on ideology alone. Other supposedly academic bodies have been found promoting false ideas for ideological instead of scientific motivations. Due to ethical restrictions, Philip Zimbardo’s prison experiments and Milgram’s experiment could never be duplicated today. A lot of interesting psychological research is off limits, perhaps for good reason. These ethics restrictions have been taken to logical extremes, where experiments testing whether making doctors and nurses use checklists improved health outcomes were stopped by the HHS because patient permission was not obtained. When I was at UCSD, my professors would tell me that when the FDA started regulating medical devices progress on these devices slowed to a crawl. Research became much more burdensome and expensive after it was regulated. One theory is that while a lot of these distortions started in the 1950’s they had a positive impact before they had a negative impact. The positive impact came from throwing money at an academia with a sizable fraction of geniuses who were doing brilliant work in their fields. The negative impact of this money was lagged by quite a few years as the structure academia pushed out more and more of the creative types. In terms of how to build a better University (Antiversity?) starting from scratch and a lot of money: The problem of picking creative geniuses instead of bureaucrats while avoiding the charlatans is potentially solvable. The problem of increased specialization could be solved partially if polymaths were the right type of people to solve the first problem. If those two issues were solved, it is likely that ideological blinders are a function of the bureaucratic mindset and this issue would also fall by the wayside. Finally, the joint issue of ethics and regulation do not seem solvable in the jurisdiction of the developed world, so perhaps they’d have to go somewhere else to address these issues. Potentially solvable does not mean easy, so this issue deserves a lot of thought. When thinking about the future of the country, many people say “Think of the children!” but fewer people wonder what those children are thinking. Looking at the chosen majors of today’s graduates is one way to measure what America’s children are thinking. Even better, their revealed preference is probably more trustworthy than surveys. The biggest thing that stands out is the increased focus on the practical. Business majors are up while social science and history majors are down. Engineering technology, which prepares graduates for a job right out of school, is up while engineering majors are down. Students have decided that they need majors for jobs that used to be done by high school graduates as they are getting more degrees in transportation, securities and protective services as well as materials moving as well as parks, recreation, leisure and fitness studies. Education majors have shrunk, but this is probably due to cultural changes that allow women more choices when it comes to their field of study. Students also see the increased demand for health services in their future and have gone into biology, psychology and health professions and related clinical sciences at increasing rates. Computer science majors have increased with the emergence of personal computers. It should be noted that this major actually peaked at 4.5% of college graduates in 2003-04 with the class of students who picked their major at the height of the internet bubble. The recent drop off in CS of 1.5% of all students choosing other majors almost exactly matches the additional 1.4% of college students choosing to major in health professions and related clinical sciences between the 2003-04 year and the 2006-07 year. 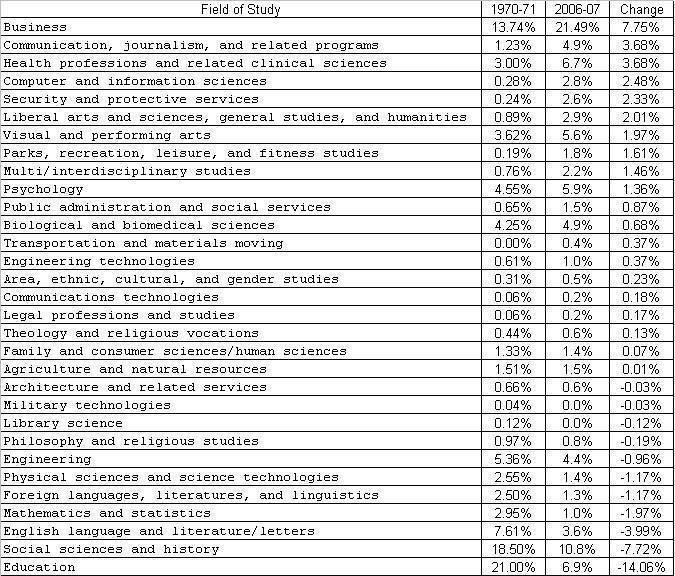 For those worried about a decline in the quantitative focus of students, the shortfall of quantitative majors is only 1.25% of the student population compared to 1970, and this number completely disappears if it is assumed that half the double majors are doing something quantitative or a fraction of the business majors are learning about statistics. Of course, the college graduate situation only looks good when comparing the United States to a past version of the United States. What is worrisome about the education picture to many people is the declining relative position of the United States compared to other counties and that will be covered in a future post. The Consumer Expenditure Survey by the BLS just released an interesting article highlighting their 30 years as a continuous survey. I decided that it could be interesting to see what their data combined with Census demographic projections imply about the future trend in savings. One way to do this is to break down the savings rate by age and project it forward. As the savings rate obviously wasn’t 17.5% over the past few years, it should be noted that the CES implied measure of savings is rather different than the personal savings rate data calculated by the BEA. In 2004, the CES changed the way it calculated income for incomplete survey responders, so the savings bias is calculated as an average of 2004 through 2008, which is about 15%. The analysis assumes that the savings rate of each group will remain constant, and combines CES data with the US Census projections with constant net immigration to predict the future path of savings rate. The census cohorts are adjusted by the relative amount of consumer units because they suffer the same discrepancies as household data, with fewer young consumer units per capita. This savings rate is adjusted downward by about 15% to be comparable to the BEA’s personal savings rate data. The results are interesting in their mildness. The savings rate is only expected to drop a little over 1% due to demographic factors. Of course, this study is biased for many reasons. The accuracy of the using the aggregate consumer expenditure data without adjustment is questionable. Social security and other retirement benefits are assumed to exist at levels comparable to the past few years. This biases the savings rate of the old cohorts higher compared to a likely scenario in which government and pensions have solvency issues due to the increasing dependency ratio. The educational and racial composition of the projections is held constant when the savings behavior of these cohorts is actually rather variable. Wealth effects are completely ignored. Arnold Kling has many interesting posts on recalculation. His theory about this recent recession is that it is driven by a need to figure out what is happening next. Imagine a central planner who decides to radically change plans. He has a huge recalculation to make in order to figure out where to allocate labor and capital. He says to some people, "Wait a minute. I am thinking. Some of you just have to stand idle while I figure this out." An interesting application of this theory is that the economy will recover more slowly if is more difficult than normal for a business to invest in what is happening next within the United States. The CBO’s 2009 long term budge outlook has an interesting chart that is not good news for most US companies focused on domestic sales. Source: Long Term Budget Outlook, CBO p 32. Their forecast is that the only spending that will increase on a per capita basis is healthcare spending. This forecast was partially made by forecasting the current excess cost growth in healthcare into the future, assuming that these costs grow less quickly past 2020 (less than half the healthcare spending is Medicare and Medicaid). There are definitely going to be changing markets and increased productivity within the “all other spending” category, but without healthcare this is a pie that is only really growing at the rate of population growth. This is an increase in the size of the economy where profits are nonexistent or seen as evil. The nature of healthcare makes it very hard to earn money in the sector. The supply of labor is restricted by licensing and thus the returns to labor are high relative to the return on capital. In less service oriented healthcare areas the FDA approval process that doesn’t shield companies from liability increases the costs and risks to investors. The uncertainty surrounding healthcare regulation makes investing in the sector even less unfriendly than it is already. If the recalculation story is true and the CBO’s projections on this matter can be trusted, the United States’ market economy might remain confused and below potential for some time to come. Menzie Chinn has a chart up at econbrowser that seems to hint that republican presidents have a predilection for deficit spending. Using a similar time series, I created a chart that looks at debt and which party is controlling congress instead of the party in charge of the executive branch. Sources: Federal debt from FRED, using data from the CBO for Q4 2009. GDP data from is from the BEA. Scott Sumner and Arnold Kling have been having a very interesting blogosphere debate about the causes behind the recent recession. Scott believes that the Fed made a mistake by letting GDP fall 8% below trend and that when the monetary authorities allow such a large fall in nominal GDP a severe recession is unavoidable. Arnold thinks that the recession is a symptom of a great recalculation in which the actors in the economy realized their previous investments were actually unprofitable malinvestments, but aren’t sure where to allocate resources towards next. This post is mainly focused on one of Scott Sumner’s arguments, while next week I will take a deeper look into the recalculation story. The blue line is the time series of 5 year forward 5 year inflation expectations, from The TIPS Yield Curve and Inflation Compensation by Refet S. Gürkaynak, Brian Sack, and Jonathan H. Wright. The green line is the 5 year forward 5 year inflation rate calculated from the real and nominal 5 year yields. The bottom orange line is the five year breakeven inflation calculated as the spread between the nominal and real rates. One of the reasons that breakevens got to be so extreme is that with the decline in leverage it became a lot more expensive to hold onto TIPs with borrowed money. Furthermore, the flight to liquidity meant that for many funds TIPs were among their most liquid assets and as such had to be sold while for others TIPs were no longer liquid enough to safely hold in such a volatile environment. In this environment, market inflation expectations were probably not as volatile as they appeared and the methodology of Gürkaynak, Sack and Wright created in 2007 a forward inflation measure that never dropped below 2% during the crisis. This may be partially because when they modeled the TIPs curve the left out the particularly illiquid front 18 months. That the Fed wasn’t forecasting deflation is also shown in the Taylor rule chart that accompanied Bernanke’s speech earlier this month. The Fed saw the signs in the market to cut rates before their forward looking Taylor rule told them they should. 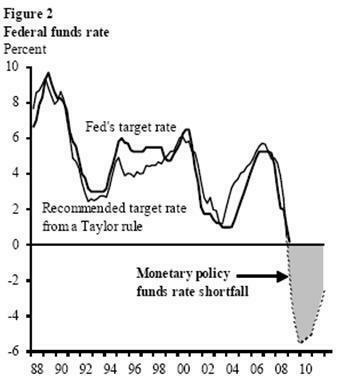 Of course, in the Taylor rule chart below the only forward looking component is inflation, not the output gap. The Fed cut rates in advance of a declining output gap but after the financial panic. Furthermore, once rates approached zero they started paying interest on reserves in order to keep their attempts from saving the financial sector from spilling over as inflation into the rest of the economy. In effect this tightened policy just as the forward inflation looking Taylor rule was hitting the zero bound and possibly going negative. Of course, the chart from Bernanke’s presentation doesn’t go negative (Perhaps to avoid questions from angry senators who were wondering why he wasn’t doing everything possible to promote full employment). However, when this chart is compared with other Taylor rule charts it is obvious that the Taylor rule is suggesting something below zero even now, which implies that the Fed may be too early in withdrawing quantitative easing. For example of these rules, take the work done by Glenn D. Rudebusch at the SF Fed in May of 2009 in which he forecasts a negative rate far into the future, which was updated by Krugman here. As a side note, Menzie Chinn at Econbrowser has an interesting post about how the fed funds futures are pricing in a policy rate much higher than anything the Taylor rule is currently predicting under a wide range of assumptions. A common meme is that with the increase in government there will be so much regulation coming out of this administration that it will be a mistake to own stocks. As much as Republicans would like to pretend otherwise, increasing regulation is not always bad for the stock market. The stock market consists of the existing capital stock and new regulations often affect the incentives for capital formation more than the existing capital stock. Increasing regulation means an increasing risk of regulatory capture, where the agencies designed to regulate a sector end up protecting the existing businesses more than the consumers the regulations are designed to protect. 1. Regulatory Standards: Companies with connections to lobbyists can try hard to make their current best practices the regulated industry standard. 2. Higher Cost of Entry: Having to deal with red tape can discourage new entries into the industry. Less competition means higher prices for the existing companies. 3. Economies of scale and red tape: The larger the company, the more capable they will be at minimizing the cost of the red tape. The intrapreneurs who are creating new businesses inside of an existing corporation will have a large leg up compared to the smaller companies and entrepreneurs who aren't equipped to deal with bureaucracies. Political rhetoric favors small businesses, political actions often do the opposite. 4. Government contracts are much more likely to be awarded to the existing players. Even outside of the personal connections, some bidding contests are outright biased against newcomers by giving points to businesses that have done similar projects in the past. So unless the government seems determined to destroy an industry, the analyst needs to weigh the effect of increased regulation's on short term earnings versus the decline in the long term earnings volatility. With lower volatility comes higher returns, especially if leverage is increased*. If increased regulation, lower volatility and higher leverage sounds like an unlikely combination, think back to Fannie Mae, Freddie Mac and the recent housing bubble. It could be said that these reasons explain why the stock market outperforms during Democratic presidencies, but that's not actually true. *Of course, with the banking sector in its current state, an environment of increased leverage is likely a long ways away. One of the constant themes of globalization is that many people feel like the developing countries are hurting them. While in most cases the benefits to consumers outweighs the opportunity cost of the people who have just lost their jobs, there are some cases where the emergence of the developing country can hurt the developed country overall. In this example country A is the developed country, country B is the commodity producing country and country C is the developing country. At Time 1, both country A and country B benefit from trade, while country C doesn't need to trade since it doesn't have any comparative advantage relative to countries A and B. At time 2, technological progress has enabled more Tech goods to be produced by countries A and technological catch up has allowed country C to drastically increase their Tech production, but resource constraints have prevented any increase in Resource production. In this scenario, Country A is damaged by country C's arrival on the global trade scene, even though this damage is mitigated by its benefits to countries B and C.
It is important to note that short of measures preventing technological knowledge from getting to country C in the first place, there is no economic policy that protects country A from this globalization driven negative terms of trade shift. Robin Hanson has some interesting thoughts on Conan O'Brien's parting message. All I ask of you, especially young people … is one thing. Please don’t be cynical,” O’Brien said. “I hate cynicism — it’s my least favorite quality and it doesn’t lead anywhere. Nobody in life gets exactly what they thought they were going to get. But if you work really hard and you’re kind, amazing things will happen. I’m telling you, amazing things will happen. He has an interesting take on why this anti-cynicism strategy might work for young people more than older people. When you are idealistic about how others will treat you in your relationships, you become more attractive as a relation partner. This helps you attract better partners. Later in life, when you are attached to particular others via relations, you are better off being suspicious and cynical, as this gives you a negotiation edge when threatening to leave your partners, and discourages them from exploiting you. If cynicism correctly applied involves closing potentially negative doors and idealism correctly applied helps to open potentially positive doors, then someone young still searching for their niche should not be quick to engage in the former over the latter. Of course, there are actually more direct signaling reasons to act age appropriately. A cynical point of view is often an attempt to signal knowledge and experience, and may people would find this signal to be in-congruent coming from a young person. The cost of sending this signal is the doors that it closes and the benefits that accrue to a young cynic are generally small if people don't believe the young cynic is capable of adding value. So the real lesson is that young people should be wary of spending resources signaling something that isn't going to work.